I just wanted to follow-up with you and see if you had upgraded to the new version and how it was working for you. I will be closing the support ticket that we have for your original issue, and can re-open it if you are still have problems with the new version. My apologies for the delay and for your continued struggles. The Mac App store has the updated version of X2Pro on it. Please let us know if that resolve your problems, please. Last Edit: 3 years 5 months ago by Jeremy Norwood. I have all but given up. It's been frustrating. Having said that, how does one upgrade to 3.0.5? Do you still have problems with X2Pro and/or have you been able to upgrade to the 3.0.5 version and use it? Please let us know if you are still seeing problems with the application. Yes, you can install Quicktime Player 7 on your Mac and keep Quicktime Player X too, it won't overwrite it or remove it or anything. Is the file (DSC_0039 (fcp1).mov) on an NTFS formatted drive (G-DRIVE 2 TB)? Can you run the two versions on the same Mac? I can provide the file. I'll send you an e-mail to obtain access to the ftp site. The X2Pro development team are working on changing from QTKit to AVFoundation, so the next update may be able to handle this type of file. It would be nice to get the file from you if at all possible to test with in our lab against the newly developed software. Could you provide that file to us, please? I can play this file (like all the others) with Quicktime 10.2. This file is in the same directory as all the others, and they have been working fine. The file path after the "Suggestions:" part of the error message, can you copy that and paste it into the forum message and then check to see if you can browse to that file and play it using QT 7. As requested, the error is attached. could you post the error message you receive in X2Pro, please? 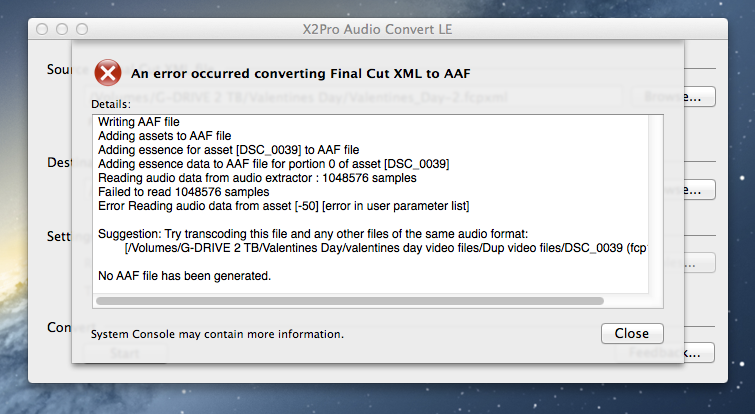 So, I've been getting X2pro to start the conversion, but it stops 3/4 of the way through at the file DSC_0039 (fcp1). I'm thinking the problem may have to do with the fact there is a DSC_0039 and a DSC_0039 (fcp1), but the "clip name" in the xml is DSC_0039 for both. Any thoughts? If you need the fcpxml again, let me know. I meant for you to remove the file from the project timeline and re-export the XML and see if the file passes through after that. Do you mean to remove the file from its directory or remove it from the xml? I tried to attach the file, but it's too large. Is there another way to get it to you? Could you provide us with the file "DSC_0020.mov"? Alternately, if the clip isn't essential to the audio editing, you may can try removing the clip and export the XMl and see if that works in X2Pro.